Users of the Offerchat live chat tool for websites are treated to two new features that affect how business communication with customers is done online. Offerchat desktop notification pops up. [...] it elevates how instant and convenient live chat is for the sales representatives and business owners manning the chats. Offerchat, a company that provides live chat for eCommerce and other sites selling products and services, deployed two new Skype-like features to all its users. 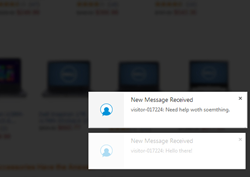 Users will receive pop up notifications on the lower right of their desktop screens for each new incoming chat. Pop up fades after a few seconds. Users will now be able to leave the Offerchat dashboard open in the browser while doing other tasks in their computers without missing any chats. Desktop notifications come with a sound alert. Activating the feature is also quite simple. In this feature, Offerchat users are now capable of editing the last message they have sent. Handy when fixing typographical errors and editing information already given to the customer. Also, being able to correct errors in the last message sent makes for a more coherent flow of ideas during a chat session with a browsing shopper. Majority of Offerchat users are avid online entrepreneurs familiar with instant messaging client, Skype. By blending text chat capabilities entrepreneurs have found indispensable in Skype to the live chat tool on users’ websites, Offerchat was able to improve its live chat user experience. The new live chat features deployed by Offerchat bring instant communication between businesses and inquiring customers to an even higher level. For sales representatives and business owners manning the chats, live chat is now more convenient. For more information, kindly view the official announcement and short guide on how to activate and use these features. In keeping with its tradition of a free live chat tool for small businesses and starters to leverage for success, Offerchat has not made these new features exclusive to any paid plan or subscription. The new live chat features, as with other essential features, are available to all Offerchat users. Offerchat is a live chat tool for ecommerce websites that help online sellers and digital marketers communicate with shoppers on their site without the latter leaving the site or resorting to other communication channels like email or phone. Because it is real-time, easy and convenient for both customers and sellers, transactions are completed easily and more sales are made.